The Last 15 is a weight loss plan created by Dr. Joey Shulman, registered nutritionist and founder and CEO of Shulman Weight Loss Clinics. This program is designed to help you say goodbye to quick fix diets that are overly restrictive so that you can let go of those last 10 to 15 pounds forever. Shulman discovered that a combination of physical, emotional and psychological factors need to be addressed to create long-lasting sustainable weight loss. By following the principles outlined in the book you can lose up to 15 pounds in the first month, achieve your weight loss goals and keep the weight off for good. Shulman asserts that The Last 15 is a set of principles – not a program – that will allow you to achieve your ideal weight in a healthy and timely fashion. You will learn how to boost your metabolism and reset your metabolic code in just thirty days by following ten simple steps. Include protein foods with every meal and snack. Eat one high fiber whole grain each day, preferably at lunch. Enjoy colorful vegetables all day. Include good fats in every meal and snack. Eat two servings of fruit every day. Drink eight glasses of water. Choose two treats each week. Protein is emphasized because it supports muscle growth, immunity, and hormonal function. Additionally 25-30% of the calories from protein are burned in the digestive process. Every meal should include 30-50 grams of protein and every snack should have 5-10 grams of protein. Carbohydrates are allowed but low glycemic foods should be preferred such as oatmeal, bran cereal and berries. Each week you are allowed to choose two treats – one glass of red wine, three small squares of dark chocolate or an extra portion of whole grains. Low fat yogurt, low fat cottage cheese, eggs, beef, chicken, fish, pork, tofu, soy milk, legumes, whey protein isolate, whole grain bread, bran cereal, oatmeal, brown rice, berries, bananas, kiwi, apricots, plums, nut butter, walnuts, sunflower seeds, avocado, flaxseed oil, olive oil, dark chocolate, red wine. Dieters are encouraged to make exercise a part of their daily routine and to schedule the time for working out. Cardio exercise should be done at least three times a week for thirty minutes. Twice a week you should do thirty minutes of weight training exercises and abdominal workouts should be done five times a week. 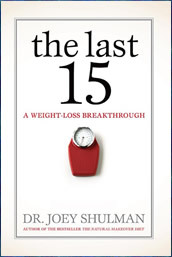 The Last 15: A Weight Loss Breakthrough retails at $24.95. Provides education about carbohydrates, proteins and fats. High protein intake can reduce appetite when calories are restricted. Includes one week of meal plans with recipes. Addresses emotional eating and psychological factors. Recommends a combination of cardiovascular and resistance exercise. Recommended meal plans are too low in calories for physically active dieters. Will require more time to be spent on meal planning and preparation. Does not include a vegetarian meal plan. Does not include any particularly unique information. The Last 15 is a weight loss program designed to help dieters lose weight and keep it off by resetting the metabolism and incorporating the principles of a healthy lifestyle. The program provides dieters with information about nutrition, exercise, goal setting and stress management and includes strategies to help you maintain your weight loss results, helping you to lose the last 10 to 15 pounds.